I had never used the front audio jack on my nzxt s340 case until today. When I connect headphones to it all I get is a loud hum, I checked it is set to AC97 so I guess it is EMI. The HD audio cable crosses over a molex cable so I tried to shield it with aluminium foil which didn't work. The cable is also routed alongside other cables running to the front panel so I guess the interference is coming from there. Are there any shielded cables available for the front panel audio or an easy fix? 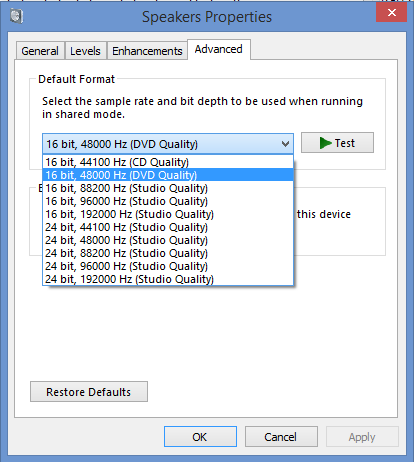 Have you ever changed the frequency and bits in audio settings? This is not EMI. It's wrong settings, bad connection, etc. Never changed those settings, the rear jack works fine and the HD audio cable seems to be connected properly. I have just disconnected and reconnected the HD audio cable to make absolutely sure it's seated properly. Checked again and same issue. I noticed that I get exactly the same hum if I put the audio jack in contact with the case which leads me to believe that the front panel is not adequately insulated from the case, i.e metal against metal. In which case the solution would be to apply electrical tape where the panel makes contact with the case, does this sound possible? Either way it won't be an easy job to find out as to get enough room to apply the tape I will need to cut the cable ties holding the front panel wires in place as I don't believe the power to the hdd led can be disconnected. I have resolved the issue. It seems that although the pins on the mobo header were going into the right holes on the plastic connector they weren't all making a good connection with the metal contacts inside. It's weird, if I disconnect and reconnect I can have the issue again, and then other times it's fine even if I wobble the connector. Seems to be about the angle when I initially apply the connection. Front panel audio jack not working.